Music composed for 'A Martial Arts Ballet' by Fred Ho. Combining music, theater and fantastic Chinese martial arts, Once Upon a Time in Chinese America is a heroic 17th Century martial arts legend of the betrayal of the legendary Shaolin Temple by a renegade monk. It is composer Fred Ho's newest action-adventure music/theater/ballet epic, commissioned by the World Music Institute, The Mary Flagler Cary Trust, The New York State Council on the Arts, David Rodriguez and the John Harms Center for the Arts, Mary Sharp Cronson and Works and Process at The Guggenheim, and Tina Chen. 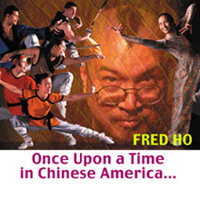 Featuring a narrator/actor performing text written by Fred Ho and Ruth Margraff with music performed by Ho's sextet, The Afro Asian Music Ensemble, ONCE... is a pioneering, groundbreaking, revolutionary multicultural work in a never before-seen explosive combination and fusion of dance and movement forms with pyrotechnical Chinese martial arts.